As was publicized last week on Zoo With Roy- the world's foremost bolg about wanting to go to the zoo with Phillies ace Roy Halladay (visit us online at zoowithroy.com)- the Hartnell Down foundation headed out to Iron Hill North Wales this past Saturday to pal around with the fine folks there... most importantly, of course, being my main squeeze Vince the Brewer. Vince sent in the following picture, which gloriously places a classic, fashion-forward (wait is that possible?) ZWR tee right next to our boy Hartsy! Last time a penguin got that close to him he broke his face, mind you. 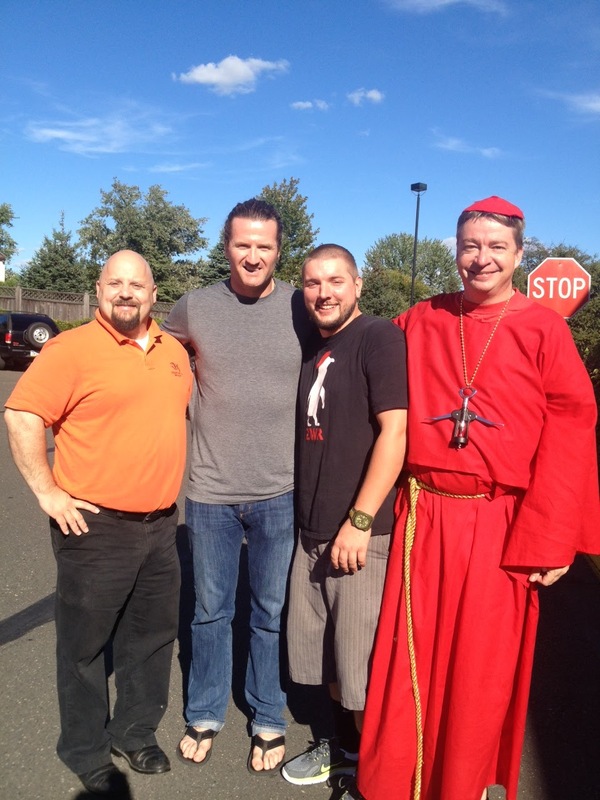 Wait but ZWR why is there some guy dressed like a monk or something wearing a bottle opener in place of a crucifix in this picture with an all-star NHL professional hockey player? Duh- they're also celebrating the bottling of Vince's award winning beer!!! This event was awesome and Harts hung around longer then most thought he would. I highly recommend you get up to Iron Hill for a few award winning pints and a damn fine hot meal. 'possible sacrilege' may be one of the best tags so far.